Have you ever read a book that left you gasping at the end of a chapter? What about a scene break that kept you reading far beyond your bedtime? Books that engage and surprise us all have one thing in common: They have good timing. From a writing standpoint, timing has to do with the mechanics of the scene. It’s less about the flowery words and more about how to structure a novel. A lot of what we’ll discuss today is nebulous. Unfortunately, that’s because writing is nebulous. What works for one book doesn’t work for another. Therefore, we always recommend that when in doubt, seek help from external sources. An oft-used adage for new writers is to “cut the first three chapters.” The conventional wisdom is that authors tend to front-load with unnecessary information. We’re really not fans of any one-size-fits-all advice. However, there are some good questions to ask yourself. For starters, your opening scene should be enough to hook the reader. What does that mean, exactly? For some books, it’s about the action. Fling the reader in the middle of a battle or heavy action. Give us some snippets of a mystery to be unraveled. Introduce us to your villain’s grand plot. For other books, it’s enough to showcase the author’s voice. Take the first chapter of Harry Potter (which functions as a prologue). How many of us were first hooked by the Put-Outer or the description of Dumbledore on a very quiet, suburban street? Knowing exactly where to start your book is part of that tricky “craft” piece. 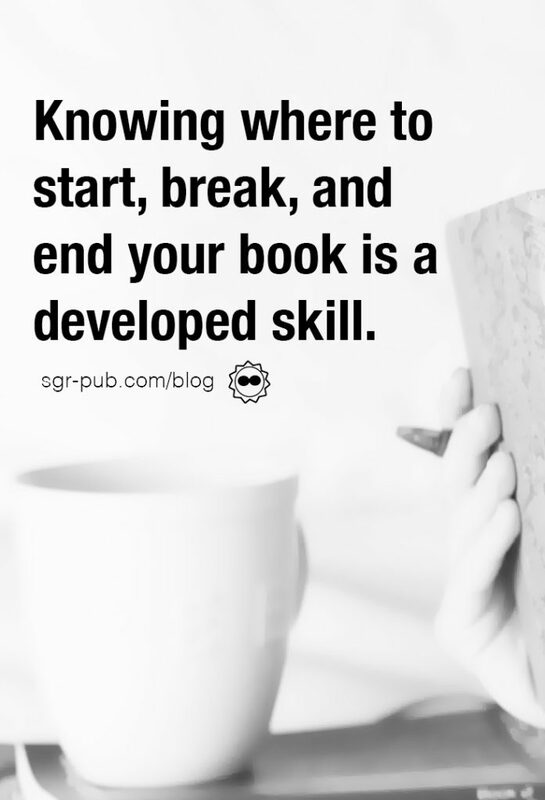 Until you’ve got the skill down, a good editor or beta readers can help. Another skill to learn is when and how to end scenes. A scene break can have many uses–from moving along the story to changing POV. Part of the book’s flow is interconnecting each of those scenes and chapter breaks using transitions. If your beginning is where you hook the reader, your scene and chapter breaks keep them reading. It’s the difference between “I can put the book down to sleep” and “I have to know what happens!” Of course, not every chapter ending needs to be on-the-edge-of-your-seat tense. Try for a balance, and, as always, listen to your beta readers. Have you ever read a book that just dragged at the end? (LOTR, we’re looking at you) When you’re thinking about where to end a book, it’s usually pretty clear. We’ve all seen Freytag’s Pyramid, which lists out the rising action, climax, falling action, and denouement (or resolution). But implementing that structure gets a little tricky, especially when writing a series. As yourself what’s the big climax of your book? Look back at your character motivations to guide you. Once you’ve hit that point, look to the next book. What’s your motivation there? 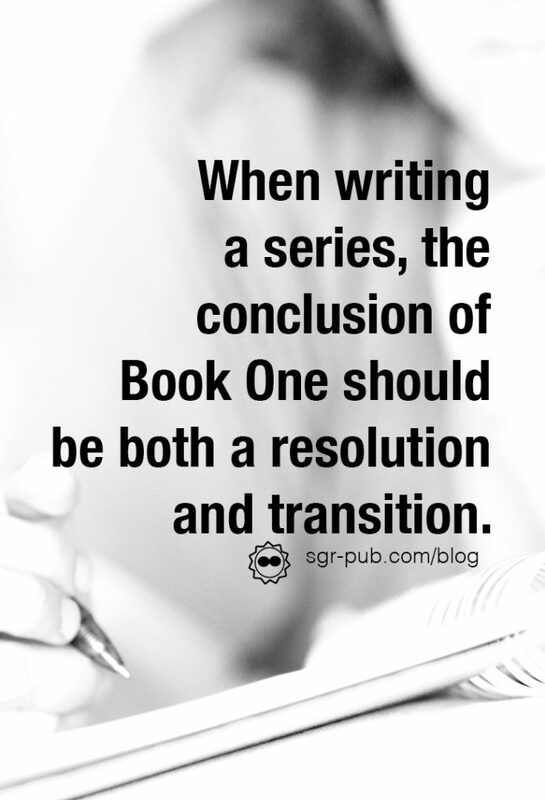 The conclusion of book 1 should be both a resolution and transition. For example, if Book 2 finds the protagonists in a new world, end the book sometime before they get there. Therefore, the reader will know what to expect in the second book, and be excited to continue. Cliffhangers have their place, as much as we love to hate them. A good cliffhanger turns the book on its head in the final paragraph. Maybe it introduces a new idea, or brings forth a new light of information we know. You could do a “Who Shot J.R.?” type ending, as well. Crafting a good cliffhanger has a few important elements. The main story of the book must be resolved. Many-an-author has been accused of a bait and switch for ending the book in the wrong place. If introducing new characters or plot, you must also make sure to not completely leave the audience behind. For example, if we’ve spent 400 pages being told that X is right, a bad cliffhanger would be to say, “No, just kidding” without any sort of foreshadowing. The good news is: Crafting a good cliffhanger is a surefire way to get readers buying your next book.